Homeopathic treatment for insect bites is very effective. If you give the appropriate homeopathic medicine as soon as possible, relief from the pain and swelling will be rapid. When an insect sting has occurred, first gently remove any stings left behind with tweezers. Then bathe the area with Calendula tincture diluted in water, and apply a cold compress to ease the pain. Calendula tincture is a homeopathic medicine that promotes healing for any wounds and abrasions. However it is not recommended for deep wounds because it can be so effective that it may cause the surface of the wound to heal before the deeper layers. 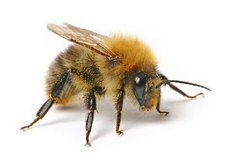 With a bee sting bathe the area in a solution of bicarbonate of soda. So which homeopathic medicines do you use? Use Ledum after any insect bite or sting, and it can also be given after an animal bite to help prevent sepsis. Especially good for mosquito bites. The sting is better for cold applications such as a cool compress or cold water, and the wound may feel cold to the touch. The pains may be pricking and stinging and there may be redness and inflammation. This medicine is used if there is considerable swelling, heat, tension and redness. Any heat makes the pain worse and it will be better for cold applications. Dosage: Give Apis 30 or 200 every 10-15 minutes until the swelling is reduced, and then 3 times a day until symptoms subside. Note:This is the medicine to use in conjunction with the patient’s medication if the patient is known to be allergic to bee stings, while you are waiting for medical assistance. My 17 lb one year old son is extremely allergic to mosquito bites. Should I treat with cider vinegar or soda and then ledum? How do I administer these. My naturopath wants to put him on a homeo imprinted for mosquito, but with an alcohol base. I am not at ease with the base. Your naturopath my be able to give you a remedy with only a minute amount of alcohol in the base but mostly water. you don’t give your son’s symptoms nut if he reacts with very swollen, red, hot skin then Apis Mellifica would be your first remedy. I also often recommend Homeopathic Histaminum. Have a chat to your Naturopath and see what she recommends. my daughter was bitten by a red ant/insect…as a result heavy itching and swelling took place..we gave anti allergic tablet..as a result itching stopped..but swelling was not completely cured..hence i gave ledum 30…but still 10 percent swelling is continuing..now also…what should i do…also she is getting allergy whenever ants bite…what is remedy for this..
she could be given the homeopsthic version of red ant or homeopathic histamine depending on the rest of the case.